Quite rare, even among the relatively scarce advertising pieces. 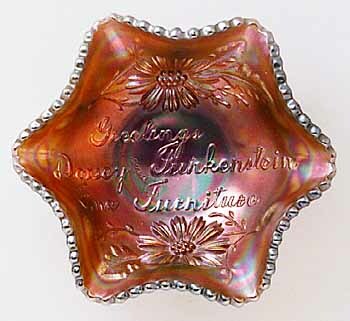 Dorsey & Funkenstein pieces were made from Fenton's Garden Mums blank. 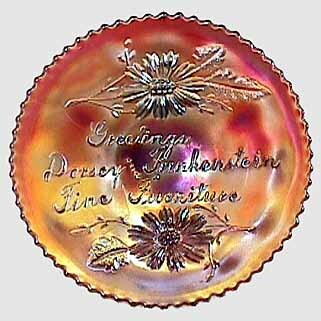 The lettering reads “Greetings Dorsey & Funkenstein Furniture.” According to the October 1917 issue of The Furniture Worker, Dorsey and Funkenstein was located in Athens, Georgia. Dorsey was at one time mayor of Athens.